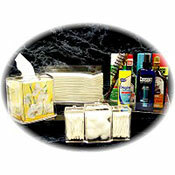 Choose from a variety of beautiful clear acrylic trays, boxes, canisters, jars, and other items. 100% natural Rattan & Palm baskets, trays, and hampers will blend seamlessly with your guest bath décor and vanity presentations. Choose from a variety of beautiful, clear acrylic trays, boxes, canisters, jars, and other items. 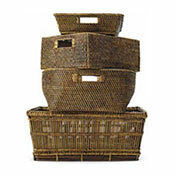 100% natural Rattan and Palm baskets, trays, and hampers will blend seamlessly with your guest bath decor and vanity presentations.